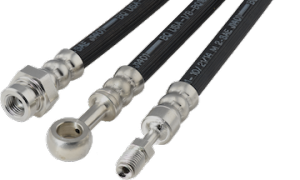 BrakeQuip’s brake and clutch hoses offer custom lines with the perfect fit for your application. Each hose is pressure tested to 3000 psi — almost triple the normal operating pressure — prior to sale to ensure safety and performance. Choose from nylon braided rubber hoses, braided stainless steel hoses, and other options to fit your needs. At WHD Canada, we have partnered with BrakeQuip to bring these safe and reliable hoses to Canadian distributors. With access to a catalog of more than 1000 brake fittings, we can supply a hose for any application without the need for unnecessary adapters.